One of the most spectacular beaches in the Dominican Republic is Playa El Cortesito and one of the best hotels in this region is Occidental Punta Cana. Done up in a contemporary style, the hotel’s decor is minimalist in nature. It oozes luxury and an understated elegance. A total of 860 rooms makes your stay a unique and an unforgettable experience. 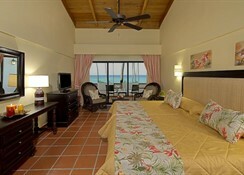 The hotel is surrounded by golden sandy beaches and palm trees swaying in the Caribbean Sea winds. With 11 restaurants, 7 of which are a la carte, and 10 bars located throughout the hotel, guests can enjoy top-notch food and drinks. The three massive pools of the hotel are surrounded by parasols, loungers, pool bars and so on. They provide you with the perfect relaxing atmosphere in the summer sun. Come night, and the party shifts to the Mangú Disco Bar, one of the best night clubs in the area. 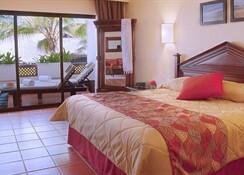 Guests can enjoy all these services and more under an exclusive all-inclusive deal offered by the hotel. The hotel enjoys a great location – right on the El Cortesito beach, which is known for its long white sandy shoreline and clear sparkling seawater. 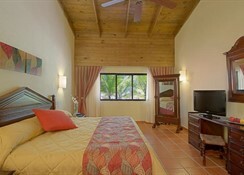 It is just 24 km from the Punta Cana International Airport. Bavaro, the nearest town, is full of bars, cafes, restaurants and night clubs. A few places of interest in the neighbourhood include Palma Real Shopping Village (6 km), Aromas Museum (3 km), La Perla Dominicana (4.2 km), Cusie Boutique (3 km), Princess Tower Casino (5 km), White Sands Golf Course (3 km), Iberostar Golf Course (7 km), Manati Park (3.6 km) and Ocean Adventures (4 km). The 860 modern, well-appointed rooms and suites of the hotel boasts of great style and sophistication. The guestrooms are spread across multiple three-storied buildings and divided into Superior, Superior Deluxe, Superior Ocean Front, Junior Suite Ocean Front, Suite, Superior Royal Level and Suite Royal Level. 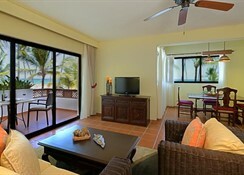 All rooms are decorated in bright and warm colours with modern furnishings and fixtures. The amenities include king-size or 2 double beds, air conditioning, minibar, satellite television, telephone, coffee maker and private bathroom. Cribs and infant beds can be requested, while in-room safe box and internet access attract extra costs. 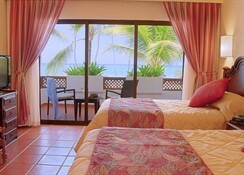 All rooms offer a sea or garden views with a furnished balcony or terrace. Superior rooms have special amenities. Occidental Punta Cana is quite famous for its great selection of food and beverages including 2 buffet restaurants, 7 a la carte restaurants, 2 snack restaurants and 10 cocktail bars. You can enjoy a pizza in the open-air La Fontana Pizzeria or fish and seafood at Caracolas. Las Reses serves grilled meats, while La Hacienda offers traditional Mexican cuisine. Via Veneto is an Italian a la carte place and D’Oriental specializes in Asian cuisine with special emphasis on seafood and vegetables. El Alcazar serves international buffet-style food. La Taqueria is a place for light Mexican snacks, while Beach Club serves buffet lunch. La Fontana Pizzeria and Las Canas Snack Bar are excellent venues for enjoying snacks and cocktails. There are also 9 bars that serve a variety of cocktails. These include Lobby Bar, Beach Club, Bar Palmera, La Fontana, Bar Flamboyan, Bar Lounge First Club, Bar Arena, Bar Playa First Club and Mangú Disco Bar. 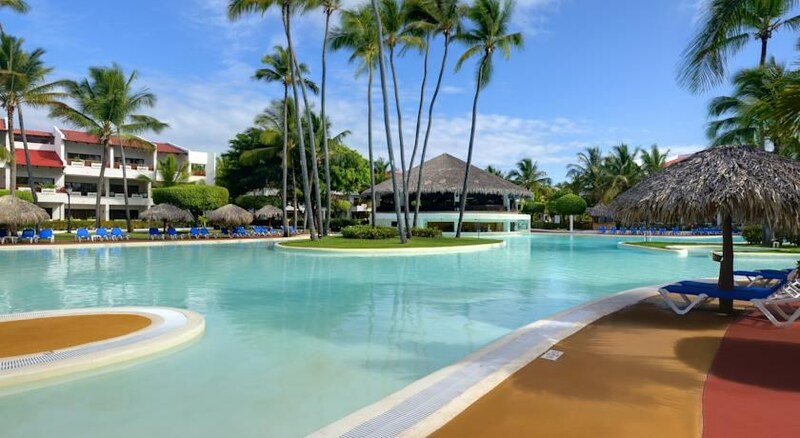 There is so much to do and enjoy at Occidental Punta Cana that it might seem a bit overwhelming. There are three swimming pools and a paddle pool for children, a fitness centre with modern machines, two tennis courts, a volleyball court, basketball court, beach football, kid’s club and playground for children. The resort also has a well-equipped gym and a full-fledged spa with numerous body and beauty treatments, massages, sauna and steam bath. 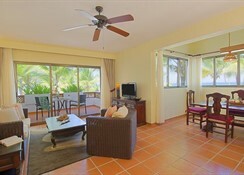 Guests have direct access to the white sandy beach that’s the perfect place to bask in the sunshine. Other activities that can be enjoyed include golf, sailboats, motorized water sports and so on. Alternatively, you can enjoy horseback riding, learn salsa dancing or enjoy a range of daytime activities provided by the hotel. During the evening, the resort organizes live music performances and shows. There is also a night club and a casino within the hotel premises.